A cast of rising stars and Met veterans comes together for this inspired performance of Puccini’s most popular opera, the immortal story of love and loss set among starving young artists in 19th-century Paris. 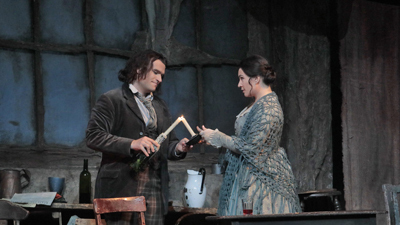 Kristine Opolais as Mimì, Jean-François Borras as Rodolfo, Marina Rebeka as Musetta, and Mariusz Kwiecien as Marcello lead the ensemble, with John Del Carlo doing double duty as the landlord Benoit and the elderly suitor Alcindoro. Riccardo Frizza conducts.